I’m not an artist, and I don’t play one on TV. Nonetheless, for Dungeon Grappling, and even more so for Dragon Heresy, I’ve taken it upon myself to fill the role of Art Director for my works. This is good, because it allows me to directly influence and drive how my works are presented to the public. It can also be very bad, because I’m not even close to a pen-and-paper artist, and so my art direction tends to fall into three categories. Text descriptions of what I want the scene to be. These can be quite long. Photo images that go along with (1). That image on the bottom is what happens when I’m left to my own devices. The art direction for the piece stipulated a tentacle beast, a mis-cast spell, and the tentacles interfering with a warrior. On the other hand, it turned into this in the final product. So there is that. An artist who shares my vision and is willing to chat with me about how things go, as well as make some corrections/adjustments on the fly, is quite important. It’s also one of the reasons I like milestone-based work, so that my talented partner (the artist) and I (the not-artist) can ensure that we’re on the same page with sketch, rough, and then proceed to final. I don’t always get it perfect, but I’m getting better. This is good. It establishes mutual expectations. But in most cases, it allows me to highlight with real things what I’m getting at. To this day I love it to death, and Rick did a fantastic job on it. But one thing that we did iterate on quite a bit was the look and heft of the weapons. 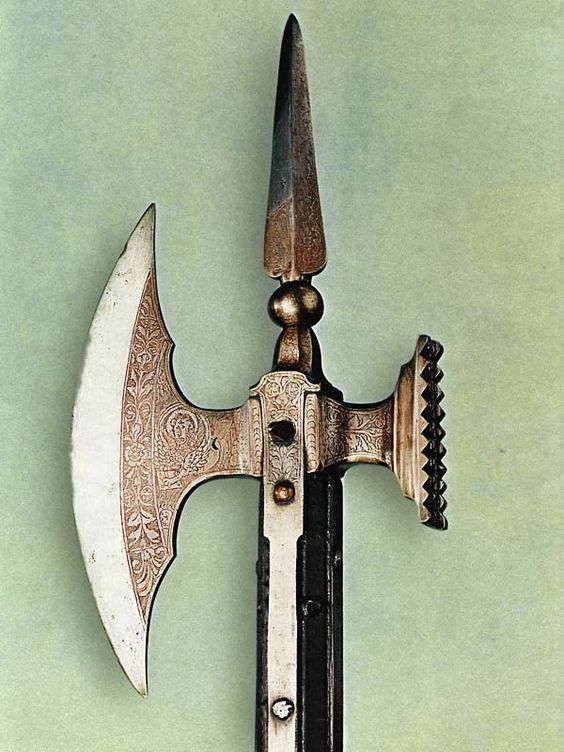 The demon’s sword and the dragonborn’s axe did not look like that in the original image. The sword was what I would probably describe as a typical fantasy sword-like-object, to borrow a term of denigration used to differentiate functional weapons from the usually overweight, usually stainless-steel things that are shaped like swords but would be very difficult to use as one in a practical sense. Well, more than one blow, anyway. 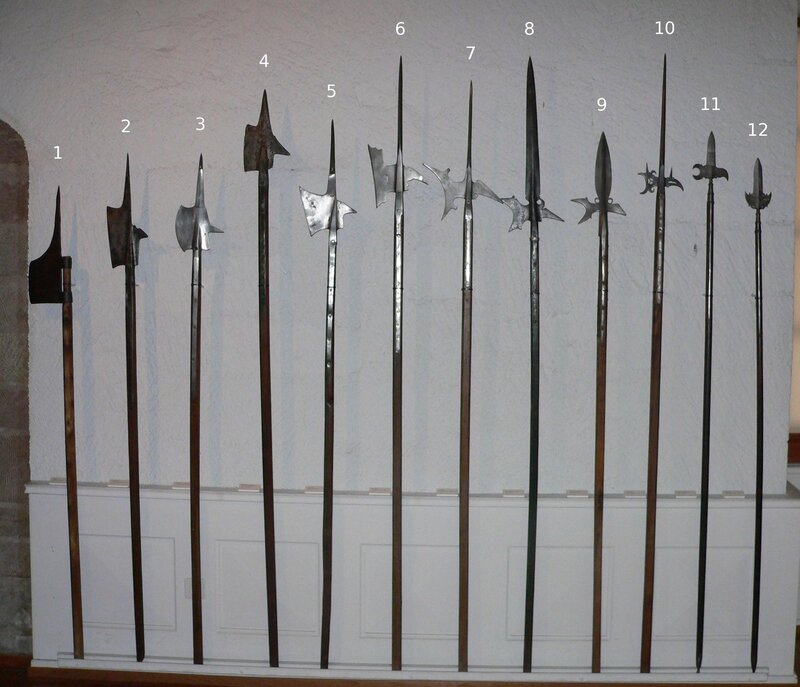 And you can see – or at least I think I can see – that Rick decided to draw inspiration from #7 in the wall of polearms, which is from a museum collection. Now, it’s not identical. It’s a magical weapon, after all. 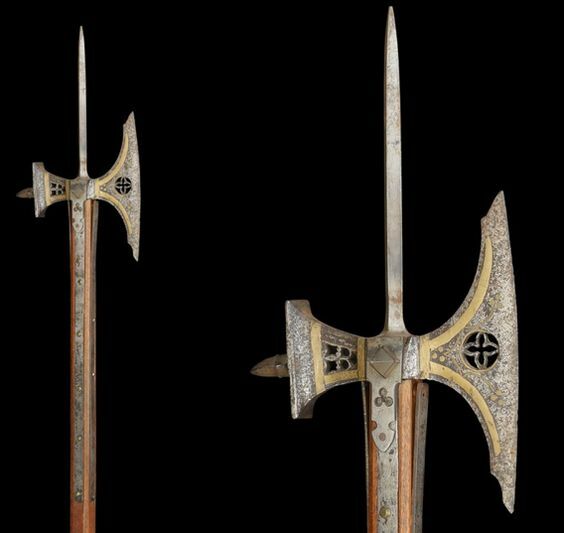 The axehead is larger than most real-world one would be . . . and yet it’s still less over-the-top than the original sketch, and its solid footing in a real-world weapon is clear. The nasty bits of the weapons are a bit exaggerated, the same way comic characteristics are exaggerated (Samuel Jackson’s art speech about comic book depictions from Unbreakable comes to mind here), but the basis of the weapon is realistic. 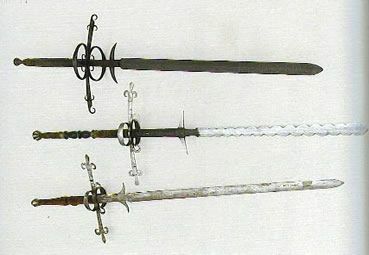 For the sword, I suggested he start with a flamberge , and you can see that some of the details were inspired from perhaps the sword on the bottom, but by and large, he took a crude-looking sword – but an actual sword shape – and then painted a lambent darkness around the blade – a skin of evil, to borrow a phrase – to show the malice of the blade. So, Rick combined artistic licence with a basis that was clear from my images. And I didn’t even have to draw anything. The other big place where reference images come in handy are for posture and stance. If you want to capture an action scene featuring a warrior, it’s probably a good idea to start with scenes and images of folks actually fighting. And for goodness sake, make sure that your warriors are holding their weapons like warriors – unless the intent is to convey that they are amateurs. Not just because she’s a great model, but I have a tendency to use my wife for creating reference images of fighting stances, particularly when the subject is female. It happens she’s a Hwa Rang Do martial arts instructor (and a PhD in wastewater treatment, and likes geeky stuff, and fully supports my time-consuming writing hobby. Yeah, I won the wife lottery.) so she knows what a decent weapon stance looks like. So when I need one, I just snap a picture. So I was able to tell Gennifer what I was looking for with grip and stance by simply emailing a photo. I find this particularly key with stance, balance and posture. Two fun images show this. The first is the model for what became the key image from the Dungeon Grappling digital art that was going to be the cover image if I didn’t hit that stretch goal, and did form the basis for the Kickstarter video. I wanted a female warrior putting an arm lock on a minotaur. So what did I send Emily, my artist? Shot 620 is of her walking towards the lower right of the camera, and then turning and “casting a spell.” Note where she grabs the staff – she made a point of how awkward it was to move with the grip as high as it was, though she also said she might have taken a higher grip if there were a giant glass ball on the top of it. Still, it was interesting and practical. This was more an aggressive “casting out of energy” feel. Shot 346 has her in an “offensive” stance with the bent arm like the image. Shot 335 has her in “defensive” stance, also with bent arm. In all cases, her grip on the stick was to keep the staff from dragging on the floor so as to not interfere with movement. If for in-scene reasons you WANT it on the floor (you need to ground out the magic), then sliding it down would work well. You can see that the middle image is pretty darn close to what went on the cover. If you don’t have access to a gorgeous redhead with a penchant for violence and costumes, you can also just search. One image for Dungeon Grappling called for a monk putting an orc into a triangle choke. So a search of “woman choking out man triangle choke images” came up with a whole bunch of options, including one that will be quickly recognized if you see the final piece. Of course, most of this is obvious. Or at least obvious in retrospect. But at least for me, the value of providing copious images ahead of time (and I’m still working on that) to the artist as part of my art direction became more and more clear over time. As I work more and more on the two projects in my hopper, and with the sheer size of Dragon Heresy if I can do it like I want (perhaps 400 pieces of art? ), the more input and clarity I can provide to the artists, the fewer revisions that I’ll need to request. Note: this isn’t a critique of any of the artists I’ve worked with on my projects! This is about me learning how to be a better communicator when it comes to things that I can’t do myself – namely, drawing. I’d welcome feedback from other artists and art directors on methods that you have used, or would like to see from art directors, to get it right the first time! I might also add that if your asking an artist for something, it might serve you well to understand compostion. The concepts, although difficult to master, are NOT difficult to grasp. Rule of thirds, Color, Contrast and Positive/Negative space will help you to describe intelligently what it is you want for your art. Heck usually I use photos of weapons and a couple of wooden manikins.